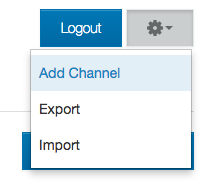 If you already have one or more channels connected to your account, you can add an additional channel by navigating to your account page, clicking the gear icon menu, and selecting the "Add Channel" option. Still need to add your first channel? Learn how here. Questions about channel types? Check out our Introduction to Channels article. Need to know how to add a specific type of channel? Head over to the 'Channels' collection in our Help Center.